Dave Dorman the freelance illustrator talked about how 20th Century Fox/Dark Horse approached him for a design for the Alien/ Predator hybrid and he created a painting around the mid 1990s as concept work for the very first iteration of the Aliens Predator movie when Dark Horse was co-producing with 20th Century Fox. However this version of the project was shelved. The work that he did for them, as is most work with film companies, was work for hire, so even though that particular production was abandoned, all of the work that was produced went into the 20th Century Fox archives. 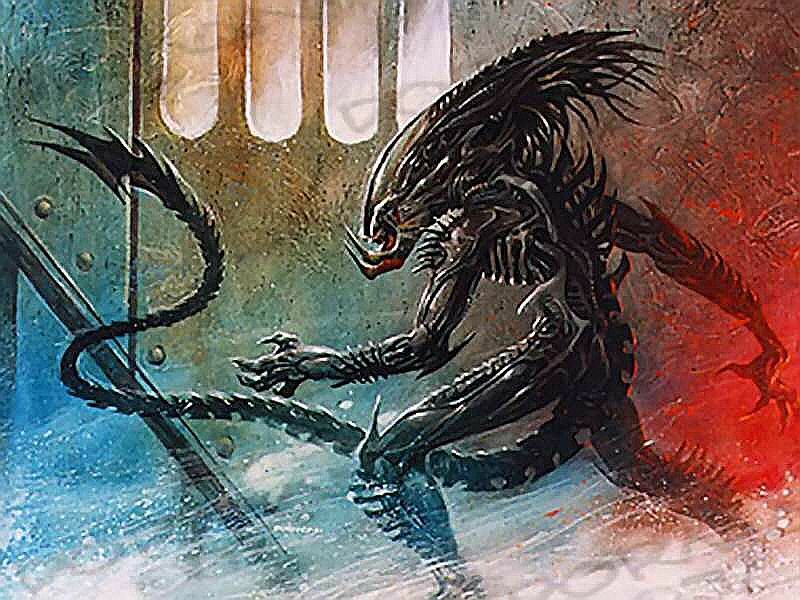 When Aliens v. Predator 2 came out, and to a lesser extent, one of the Aliens v. Predator video games, they utilised imagery that Dave Dorman noticed was very close to the designs that I created for the initial abandoned film. Technically, he couldn't say that he created the imagery that they used, because it was “work for hire”, and was keen to point out the similarities between his work and the final Predalien design. 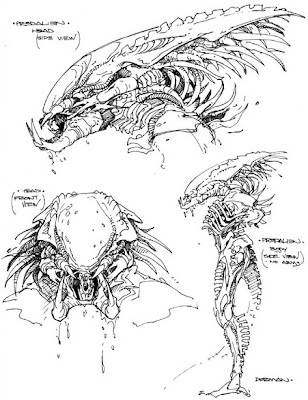 His idea about the Predalien design was that both the Predator and the Alien were both humanoids in basic structure. Obviously their heads are different, but he wanted to keep the recognizable elements of both head designs and try to work them together for the creature. Thus it was a matter of taking bits and pieces, just as one would with mixed breeds of dogs, where one would recognize elements within the creature, but not necessarily be more one breed than the other. You are credited as creating the first art of the Predalien, does that mean you actually created the creatures look? A: I did Predalien designs for the very first iteration of the Aliens Predator movie way back in the 1990′s when Dark Horse was co-producing with 20th Century Fox. The work that I did for them, as is most work with film companies, was work for hire, so even though that particular production was abandoned, all of the work that was produced went into the 20th Century Fox archives. When Aliens v. Predator 2 came out, and to a lesser extend, one of the Aliens v. Predator video games, they utilised imagery that was VERY CLOSE to the designs that I created for the initial abandoned film. Technically, I can’t say that I created the imagery that they used, because it was “work for hire” but as I have displayed on my blog, I am just displaying the similarities in the designs. Then my mind goes back... to the mid 1990's. I was hired by 20th Century Fox/Dark Horse Productions to develop some Predalien creature designs for the (then viable) first incarnation of Aliens v Predator. I did a number of designs, including the one shown here. Well much to my surprise here I am looking at my designs, in the flesh, so to speak! I have posted here my original designs and the photos showing the quite distinct similarity! galactic-squid:You are credited as creating the first art of the Predalien, does that mean you actually created the creatures look?